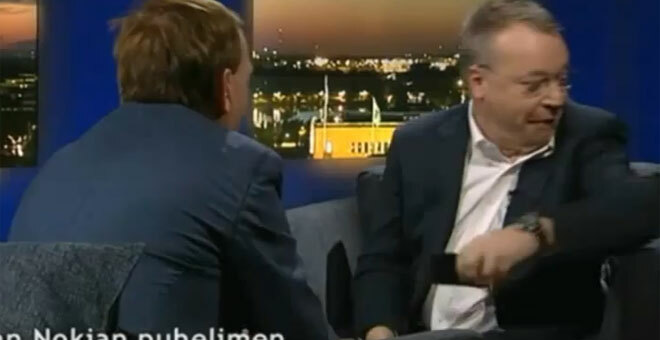 In a rather awkward interview on national Finnish television show, Nokia CEO Stephen Elop didn’t hesitate to unequivocally call the iPhone “embarrassing” after the interviewer showed him his Apple smartphone. Shortly after that, Elop threw said smartphone on the ground. In his nagging for more information regarding the yet unofficial, but highly rumored Lumia 928, the interviewer shared to Elop that he uses an iPhone, but also expressed his disappointment with the device and a desire to change it for a Lumia 928. Apparently, Elop felt he had no choice, but to throw the expensive smartphone away. Elop soon comforted the TV reporter that he would have his iPhone replaced for a brand new Nokia, although it’s not clear what phone would Nokia’s CEO give him. My bet goes for a Lumia 920. Note: this video just begs for being remixed into the song and music video by The Lonely Island – Threw it on the ground.